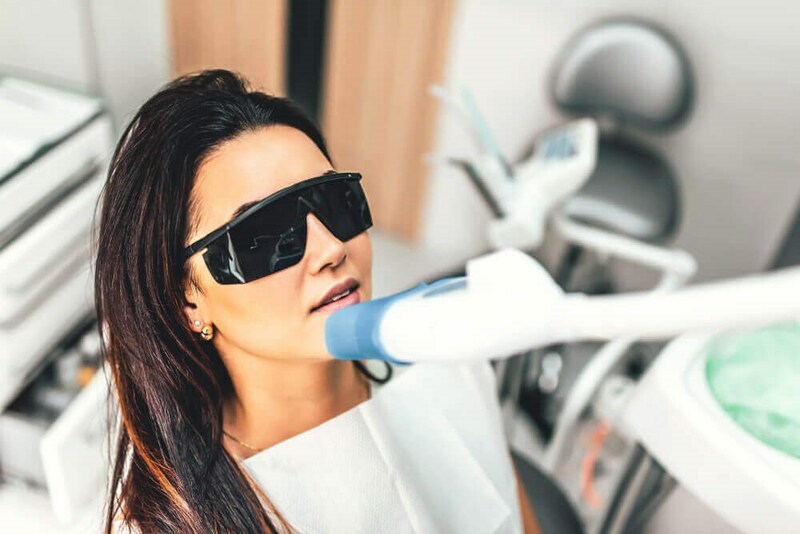 When you have so many teeth whitening products (strips, gels, toothpastes, and more) you can pick up at the store, why should you get professional laser teeth whitening at your dentist? For one, it's more effective. All the over-the-counter teeth whitening products have limited strength, so it can take a long time to see visible results. With laser teeth whitening, your teeth will be several shades brighter in one appointment. This can be helpful if you have an important event (like a wedding or reunion) and you want your smile to be whiter fast. Second, store-bought whitening products are generic, which means they don't consider your specific needs and goals. You may choose a product that's too harsh for your teeth, which may lead to tooth sensitivity and weakened enamel. Your High Point, NC dentist knows your teeth and what level of whitening is safe for you. Your dentist can also help make sure your teeth still look natural and white instead of unnatural or even fluorescent, which happens to some people when they over-whiten at home. Laser teeth whitening is also your best choice if you have dental restorations (crowns or bridges). Store-bought whitening products will not work on artificial surfaces, so your results will be uneven. Finally, laser teeth whitening is better at correcting internal stains compared to products you use at home. If you have severe discoloration, laser teeth whitening is going to be your best option to get back a bright smile. HOW DOES MY SMILE GET DULL? Every time you eat or drink, extrinsic stains can develop on the surface of your enamel. Over the years, the stains accumulate and make your teeth dull and yellow. Some of the biggest culprits of staining are berries, coffee, tea, and tobacco products. While food and drinks, as well as plaque and tartar buildup can stain the external enamel, you can also have intrinsic stains affecting the interior of your teeth. Intrinsic stains are typically the result of using tetracycline antibiotics or a trauma to a tooth. Natural aging can cause both intrinsic and extrinsic stains. These internal dental stains cannot be removed with over-the-counter whitening products. If you have intrinsic stains and you want a brighter smile, you should talk to your dentist in High Point, NC about professional whitening options. After a thorough consultation, your dentist will create your custom laser whitening treatment plan. Your laser treatment will typically be performed after your professional cleaning. This helps to remove built up plaque and tartar so the treatment can evenly whiten your enamel. Once your teeth are cleaned and dried, a protective barrier will be placed over your gums. Then, the whitening agent will be carefully brushed onto your enamel. With your eyes protected, the laser light will be aimed at your enamel to activate the whitening gel. This process may be repeated several more times until your goal is achieved. To finish, the gum barrier will be removed, and any excess whitening gel will be cleaned off your enamel. After your laser whitening treatment, it's important to keep your smile looking bright. At DentalWorks - High Point, we advise our patients to develop a good home oral health routine with twice daily brushing and flossing to remove everyday stains. In addition to routine brushing, you should brush, use mouthwash, chew sugarless gum, or all three after you eat or drink something that may stain your teeth. For dark-colored beverages, you can use a straw, so the staining liquid doesn't get on your teeth. If you smoke or use other tobacco products, quitting will keep your smile from getting dull and yellow quickly. Professional cleanings at your dentist every six months will allow your dental team the opportunity to remove plaque and tartar buildup, which can dull your smile, as well as polishing away stains from your enamel with special tools. For patients who want to touch-up or boost their results without another full laser treatment, DentalWorks - High Point offers professional home whitening kits. Your dentist will make custom whitening trays for a more comfortable treatment than store-bought kits. Based on your needs and goals, your dentist will choose the appropriate level of whitening gel for your kit. Before you leave with your personalized whitening kit, your dentist will give you clear instructions on how often to perform the treatment and how long to leave the gel on your teeth for safe, effective results. DentalWorks - High Point is a premier practice with general dental procedures and cosmetic treatments. Our skilled team is experienced in laser teeth whitening as well as other advanced dental procedures. If you believe your smile could benefit from laser teeth whitening, contact our office in High Point, NC to schedule your consultation. Our team will be happy to listen to your needs, concerns, and goals before discussing your whitening options then creating your custom treatment plan.